With most British mystery series these days trending towards the dark and gritty, fans of cozy and lighthearted mysteries are apt to have a tougher time finding new shows to enjoy. Luckily, Acorn TV has noticed that unmet demand and taken steps to fill it. In early 2018, Acorn TV announced they'd commissioned a second series of the popular but cancelled Agatha Raisin series starring Ashley Jensen (for which a Series 3 has now been commissioned). Now, Acorn TV is bringing us a completely original mystery series that's sure to appeal to the same crowd. 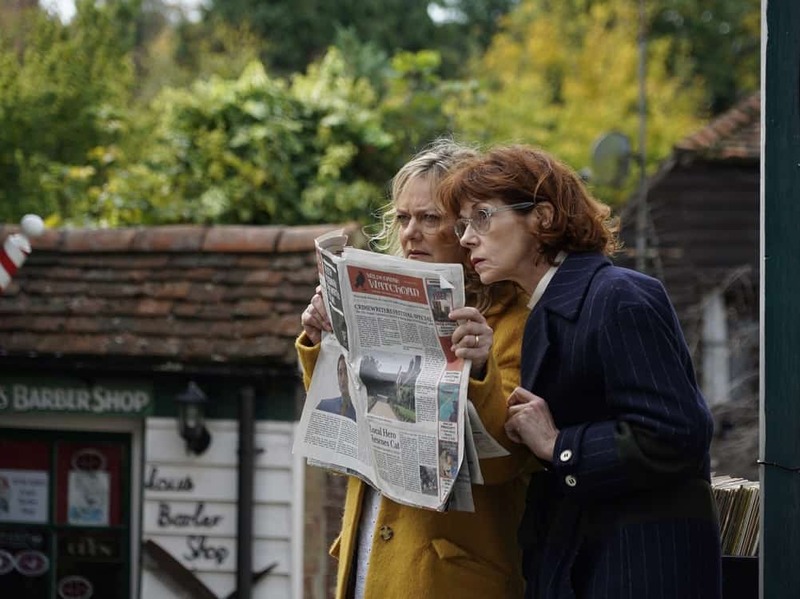 Queens of Mystery is a fun and bloodthirsty romp through rural England, with a strong cast of female leads and enough of an ongoing mystery to make you want to binge it all in one sitting. I'm serious. If this is your kind of mystery, you may want to wait until they've released all the episodes. What is Queens of Mystery About? First off, this is not to be confused with the South Korean series, Queen of Mystery. Queens of Mystery follows a young, single detective and her three meddlesome aunts, all of whom are crime writers. As young Matilda tries to settle into her new detective position, her aunts somehow manage to find themselves in the middle of all her cases – and her love life. 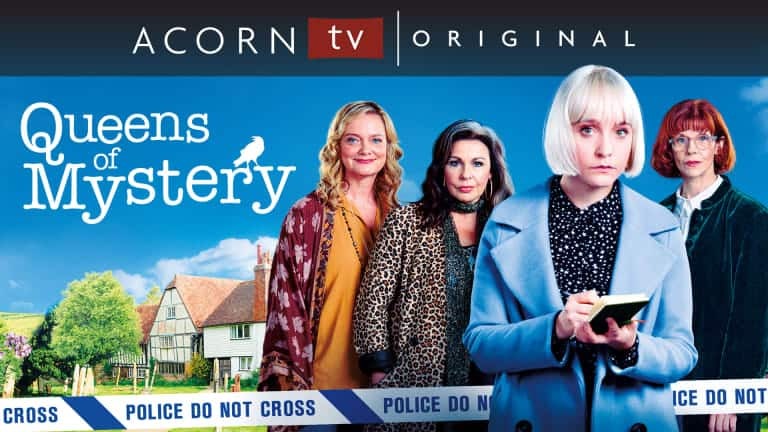 Queens of Mystery was created by New Tricks and Doc Martin writer Julian Unthank, and it will air starting on April 8th as an Acorn TV exclusive. 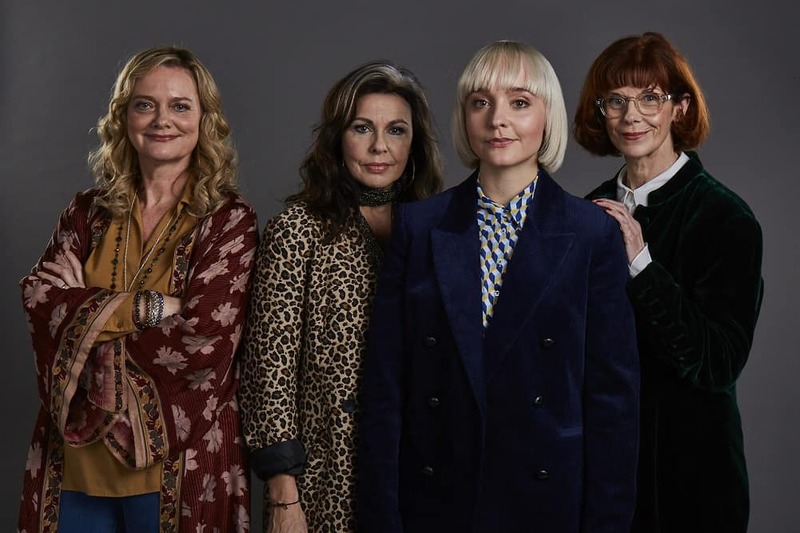 The capable Olivia Vinall plays Matilda, but the supporting cast is where this series really shines, with motherly Aunt Beth (Sarah Woodward, The Politician’s Husband), edgy Aunt Cat (Julie Graham, The Bletchley Circle, Shetland), and brainy Aunt Jane (Siobhan Redmond, Alfresco). The series also features Andrew Leung (Doctor Who) as Matilda's crush Dr. Daniel Lynch; Rebecca Grant (Doctors, Holby City) as Daniel's regrettable girlfriend Natasha; Michael Elcock as PC Terry Foster who suffers from an unrequited crush on Matilda; and Martin Trenaman (The Inbetweeners) as Inspector Derek Throne. Guest stars include Selina Cadell (Doc Martin), Omid Djalili (Dickensian), Chu Omambala (Liar), and former Bond girl Carmen Du Sautoy (The Man with the Golden Gun). What's the Verdict on Queens of Mystery? We wholeheartedly recommend this series to anyone who appreciates the lighter, gentler British mysteries. It has notes of Amelie and Pushing Daisies paired with the phenomenal scenery of mysteries like Rosemary & Thyme, Agatha Raisin, Shakespeare & Hathaway, or Midsomer Murders. Fans of Agatha Raisin will likely notice this series has a similar tendency to work a bit of humor and absurdity into otherwise serious situations. Queens of Mystery is fun because it doesn't take itself too seriously. It adheres to the conventions of any good British mystery – respectable body count, unexpected twists, and an appropriately annoyed copper constantly chasing off meddling would-be sleuths – but it also feels like it might be poking fun at the conventions a bit, too. While few light mysteries could be confused for documentaries, Queens of Mystery seems to have said, “Sod off, believability – we're having fun here!” All three aunts are crime writers? All three crime writing aunts find themselves mixed up in their niece's first three murder investigations? It's not even a little bit realistic or believable, but it's great fun. Queens of Mystery is also an artistically enjoyable watch. They've made great use of light and color, again bringing to mind shows like Agatha Raisin, Rosemary & Thyme, and Shakespeare & Hathaway. The cinematographers and wardrobe stylists should be commended on the visuals in this series. It's the perfect antidote to watching too many of the bleached-out, atmospheric mysteries that are almost completely devoid of color. Are There Any Negatives to Queens of Mystery? Having watched the first four episodes (two mysteries), the only thing that might very slightly dampen my enthusiasm for the series is that it struggles just a little under the weight of what it's trying to do. While most mysteries focus on either the cops or the amateur sleuths, Queens of Mysteries plays both sides equally. It mostly works, but there are times it feels like one side or the other could use a bit more screen time. That's made even tougher by the fact that it's not one amateur sleuth, but THREE. With one detective and three meddling aunts, the show has wisely decided to focus on one aunt in particular for each episode. It also helps that each mystery takes place over two 45-minute episodes, and a narrator delivers a lot of the exposition (it's much more efficient than trying to reveal all those details through scenes and flashbacks and character-to-character dialogue). Without those choices, the series could have been an absolute disaster. As it is, you may feel the strain every now and then, but for the most part it does a very good job of handling the unconventional mixture of professional and amateur investigators. 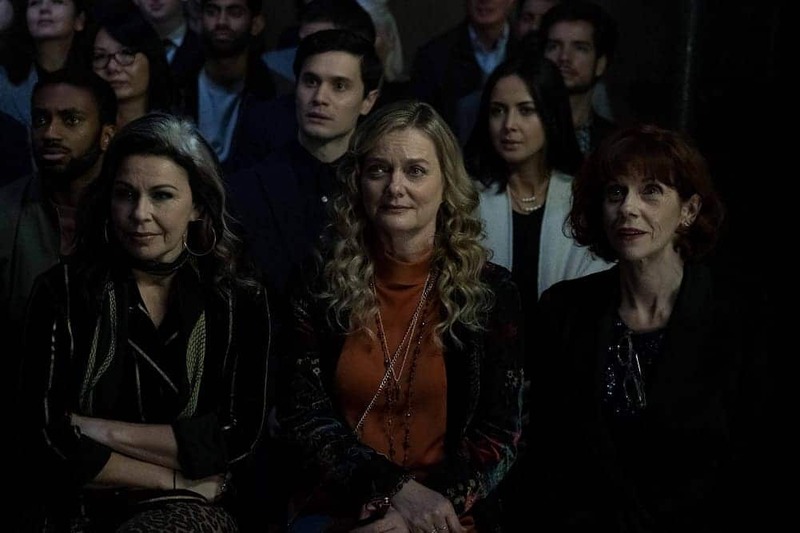 With the initial three-mystery season giving us a glimpse into the lives of the three aunts, it will be interesting to see where things go in Season 2, should there be another. My guess is that it will really come into its own in a second season, what with much of the backstory laid down. Queens of Mystery premieres on Acorn TV starting on April 8th. This is an Acorn TV Original that they commissioned, so you'll need an Acorn TV subscription to check it out. Remember – you can subscribe directly with Acorn TV, or you can also subscribe through Amazon (recommended if you have a Samsung smart TV and no external streaming devices like a Roku). Episodes 1 & 2, Murder in the Dark – The newly-promoted DS Matilda Stone finds herself investigating a murder at Hiddledean Hall, home to the 15th Wildermarsh Crime Writer's Festival. Episodes 3 & 4, Death by Vinyl –It will come as a surprise to no one to learn the wild Aunt Cat has an equally wild past. In this episode, past creeps into present, with a murder involving the 80s new wave girl band Cat once toured with. Episodes 5 & 6, Smoke and Mirrors – When one of Aunt Jane's books is adapted for a local theatre, the production is interrupted when a cast member is crushed by a falling sandbag. I hope this isn’t a comedy mystery! Would like to see good mysteties likeVera! Even the dark mysteries! The comedy mysteries are good, but British mysyeries that are great are getting old. I haven’t seen any new good mysteries from Britain. Waiting for the good detective shows. Endeaver, Morse, Det. LEWIS, WHITE Chapal, Paranoid, Luther, Marcella,The Killing. When you add the comedy, it loses the intesity needed for a good mystery. Came to the British for the good mysteries. Thinking of giving up a few of my stream apps if I have to watch the same good ones 50 times! If you don’t like the comedy mysteries and you prefer the dark and gritty ones, this will probably not be your cup of tea. On the bright side, the majority of the new mysteries are the darker variety, so you’ll have plenty to watch. Killing Eve, Luther, Marcella, and Endeavour are all coming back for new seasons this year, and there are several brand new series coming out you might like. Keep an eye out for A Confession, Baptiste, Deadwater Fell, Dublin Murders, The Barking Murders, The Bay (people are calling it the new Broadchurch), The Stranger, and The Victim. I’m not sure any of them have the long-term potential of the older series (aside from maybe Baptiste), but they’re all darker crime/mystery-type series. I’m happy to say it is, indeed, a light-hearted mystery. I am tired of “gritty”, gruesome murders, with the “f” word in constant use — of which there is an over-abundance from which to choose. Bring on more of these cozy mysteries combined with a sense of humor! I agree this show is fun to watch! I look forward to the other episodes. So fresh and delightful with quirky caracters ! By the way I just love Acorn tv. We watched Queens of Mystery last night and thoroughly enjoyed it. Light with some humor but enough meat to keep it interesting. Looking forward to the next 4 episodes. I loved the first 15 minutes. But to be honest, the Narrator aspect got old REALLY QUICK. The show would do well to severely reduce the amount of Narrator time. I love Queens of Murder, and so excited about this series! Haven’t laughed this hard in ages! The first one, about the presentation of a book award is so witty and “tongues-in-cheek” that I would almost call it camp just for a moment. We’ve all met people like this at mystery=literature events and the send up was too too funny. But there were also many serlous and thoughtful moments to balance it with. I have now binge-watched the entire first season and I’m very eager for another couple of years! By the way;, the third show had no English subtitling for the hard-of-hearing. We would all much appreciate it whether for hearing or for the occasional Britishisms that we might not be familiar with. Thanks and Good Luck!! I’m in the UK so can’t even watch this unfortunately as Acorn subscriptions are not available. Will it be available if ever, or is there an alternative way to watch this?